After the inspiring ISASR conference last year in Belfast, and due to the XXI IAHR World Congress 2015 in Erfurt, Germany, this year we will hold a small, but powerful one-day workshop-style conference at the Long Room Hub, Trinity College Dublin, on Monday 11th May 2015. To mark the four year anniversary of the ISASR’s foundation, and to show support for the development of the academic study of religions in Ireland, we decided to use this opportunity to look back as well as forward, and to present to each other, and to a wider public, a selection of the innovative work that is being done in different places and also to consider the role that the academic study of religions has begun to play in Ireland in recent years. CALL: The format for the presentation of research will be a “research slam”, which is a quick succession of presentations (7 minutes max. per presenter) that gives a lively impression of a project, a programme or a collaboration the presenter is participating in, followed by audience discussion. We encourage presenters to experiment with format and material, so long as it fits into the 7 minutes – if you wish to use a poster, images, objects, didactic material or theatrical experiments – please specify in your proposed research slam what you would need on the day. Please, submit research “slam” proposals in the form of a title and brief (max. 250 words) description of your “slam” to Alexandra Grieser at griesera@tcd.ie by the deadline of Friday 27 March 2015. Spaces in the “slam” session are limited by the time available; if there are more proposals than places available, the conference organisers together with the ISASR Committee will decide on the proposals to go forward for the slam session and inform proposers accordingly by 3 April 2015. In addition to the “slam” session there will alternatively be a poster display throughout the afternoon in the conference room. Proposals for posters (space is limited to 12 posters) are welcome. Poster proposals consisting of a poster title and a brief description (approx. 100 words) should be sent to Alexandra Grieser at griesera@tcd.ie by at the deadline of Friday 17 April 2015. Posters should present a project on either one A1 or two A2 formats. Please note that there are no special facilities for presenting the posters at the conference venue, and only white tape/easy-peel tape or blue-tack is allowed to be used on the walls and so laminated paper or using a paper quality of at least 210 gram is highly recommended. Monday, 11th May 2015, 2-7.30 p.m.
ISASR AGM (ISASR members only) will take place from 11.30-12.30 p.m.
2.15 – 4.10 “Research Slam”: colleagues & PG students of ISASR presenting a series of short (7-minute) research projects, programmes and collaborations, with discussion. Full list of abstracts available here. 4.10 – 4.15 Announcement of the latest issue of JISASR, the society’s journal. 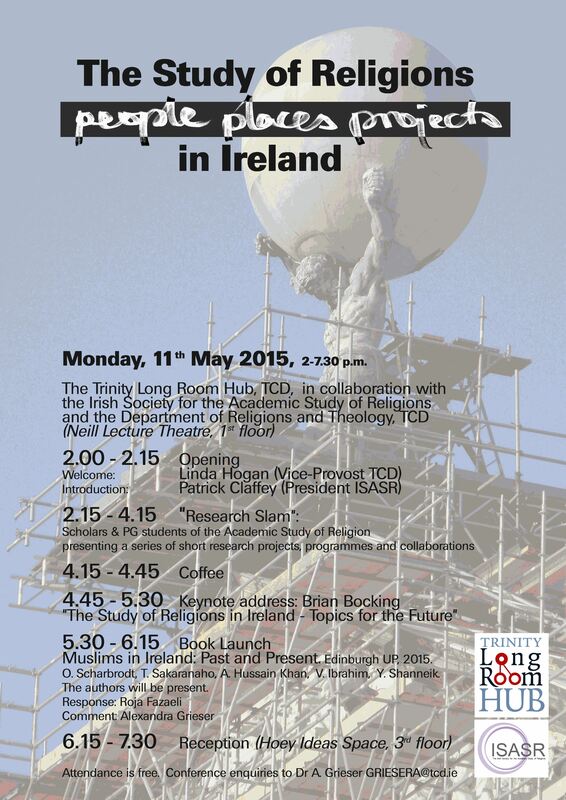 5.30 – 18.15 Book Launch Muslims in Ireland: Past and Present. Edinburgh: Edinburgh UP, 2015. Oliver Scharbrodt (University of Chester, UK, formerly UCC); Tuula Sakaranaho (University of Helsinki); Adil Hussain Khan (Loyola Univ, New Orleans); Vivian Ibrahim (University of Mississippi); Yafa Shanneik (Univ of Chester). The authors will be present. See this link for a flyer and discount sales until 31.5.2015. Monday, 11th May 2015, 5.30 p.m. The authors will be present. “Muslims in Ireland: Past and Present”. Edinburgh: Edinburgh UP, 2015. Oliver Scharbrodt (Univ. of Chester, UK, formerly UCC); Tuula Sakaranaho (Univ. of Helsinki); Adil Hussain Khan (Loyola Univ, New Orleans); Vivian Ibrahim (Univ. of Mississippi); Yafa Shanneik (Univ of Chester). Responses: Alexandra Grieser: “Writing a pluralist History of Religion – Europe and Ireland in a global framework”; N.N. Since 9/11, the interest in Muslims in Europe has increased significantly. There has been much public debate and academic research focused on Muslims living in larger Western European countries like Britain, France or Germany, but little is known of Muslims in Ireland. This book fills this gap, providing a complete study of this unexplored Muslim presence, from the arrival of the first Muslim resident in Cork, in the southwest of Ireland, in 1784 until mass immigration to the Republic of Ireland during the ‘Celtic Tiger’ period from the mid-1990s onwards. Muslim immigration and settlement in Ireland is very recent, and poses new challenges to a society that has perceived itself as religiously and culturally homogeneous. Ireland is also one of the least secular societies in Europe, providing a different context for Muslims seeking recognition by state and society. This book is essential for anyone who wants to understand the diversity of Muslim presences across Europe.